Looking for Herrin Hauler truck beds? 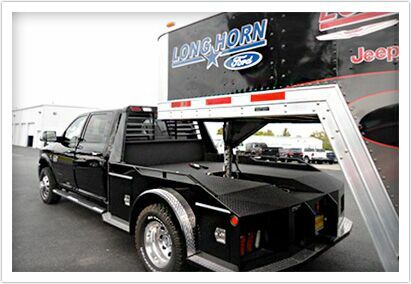 Longhorn Ford and Lone Star Dodge offer Herrin Hauler truck beds for our Ford F-Series and Ram Trucks. Herrin has been building quality truck beds and bodies that East Texas businesses have counted on for over 50 Years. Whether you need a heavy duty truck bed, hauler bed, RV hauler or flat bed we have you covered with the truck and the bed. Herrin Hauler uses only high quality steel and stainless steel hinges combined with experienced welders to build a long lasting quality truck bed. Each truck body is sandblasted, primed, sealed and hand sanded to achieve the best results. Some of the standard features built into Herrin Hauler beds are tie down brackets, tool box on each side of bed, heavy duty rails, gooseneck hitch and a receiver hitch. Whatever your truck bed needs we have a solution to meet your needs at Longhorn Ford and Lone Star Dodge. We can even install a high quality spray on bed liner in house by our truck accessory pros. To find out more about Herrin Hauler truck bodies on a new Ford or Ram truck just give us a call at (888) 992-9758.